The SW-1000 advertises itself as though it were a piece of art. The equipment was built with the operator in mind. We use stainless steel fittings, dual sediment filtration, dual carbon block filtration, stainless steel Reverse Osmosis housing, and a stainless steel Ultraviolet sterilizer. As you compare our machine to our competitors, you’ll find our competitors use PVC for these items. Blue Bottle Vending machines also have the unique option to rinse the bottle before filling. We know that your customers will appreciate this feature; one that will encourage ongoing and repeat business. The SW-1000 offers a 1, 3, and 5 gallon options standard with the option to convert to liters or any other desired volume. Our equipment is capable of remote monitoring, coin, cash, credit card, and mobile payments. We’ve eliminated the need for the clear acrylic vend compartment door that becomes an eyesore and expensive to replace. The SW-1000 uses low energy high efficiency Reverse Osmosis elements to cut utility costs. Our hot and cold water sinks give hot water on demand. It is built with durable plastic and aluminum diamond plate, making it extremely attractive. 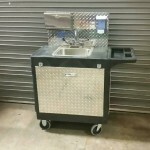 Our sink is perfect for use at retail commercial locations, catering events, or anywhere elsewhere else there is a need for washing hands. The locking wheels keep the cart stationary, preventing the cart from rolling away. It also comes standard with a paper towel rack and soap dispenser.